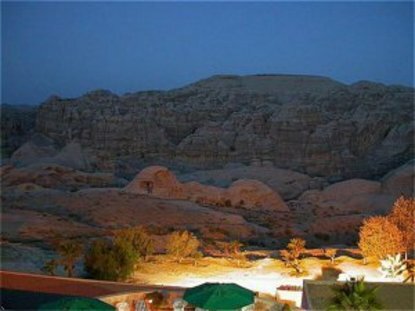 Set against a breathtaking view of Petra one of the worlds seven wonders, Crowne Plaza Resort Petra, a deluxe hotel, is the only real choice for your visit to discover years of history. Besides the unique view provided from the hotel's patio of the dramatic Petra Mountains, the Crowne Plaza Resort Petra is only steps away from the visitor's entrance to the siq and the old city with its world famous archaeological sites. The capital Amman is a three hour drive away. Crowne Plaza Resort Petra has 147 rooms with High Speed Internet connection , including 3 suites and 30 superior rooms. 31 hillside chalets tucked into the Petra rock face overlooking the visitor's entrance the site. Heated outdoor swimming pool and, 3 Restaurants, lobby bar, evening cocktail lounge with dance floor, conference room, 2000 year old "Nabatean Tomb" the Cave Bar is fronted with a large piazza ideal for groups and incentive gatherings with space to cater for up to 200 guests are some of our services, dining&regs & entertainments. The Basin Restaurant in the old city offers lunch in a setting unmatched by its beauty. Outside catering can be arranged by our staff in a variety of unique locations outside the hotel, and local entertainment will bring traditional flavor to your event.